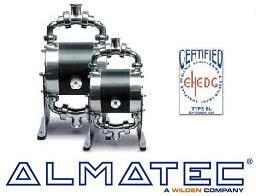 Almatec is one of the world’s leading manufacturers of pneumatic diaphragm pumps. Their production began in 1984 and is based on decades of experience in the pump sector. Numerous trend-setting developments resulted and the product range diversified to provide solutions to a whole variety of problems in many different industries. Since the company was founded, it had produced and delivered some 120,000 pumps to customers around the world. Capable of dry-running, self-priming and passing solids. Composite diaphragms with integrated outer piston eliminates a potential leak path. Built in accordance to essential specifications (ATEX, EHEDG, FDA, USP Class VI, etc.) to meet customer needs. CIP (Clean In Place) and SIP (Steam In Place) capable. Suitable for high purity applications. Pulsation dampener available for smooth, steady, pulsation-free flow.